GIUSEPPE ANTONIO BRESCIANELLO (1690-1758): Sinfonie in F and in D, Ouverture in G Minor for 2 Oboes, 2 Violins, Viola and Continuo, Chaconne in A for 2 Violins, 2 Violas and Continuo, Concertos in G Minor for Violin, Oboe, Strings and Continuo and in B Flat for Violin, Bassoon, Strings and Continuo. 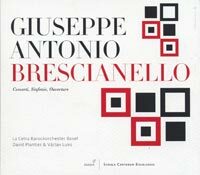 Description: This first all-Brescianello disc we've offered is a complete delight and should appeal to collectors of Vivaldi (the concertos have his vivacity, freshness, motoric fast movements and softly lyrical slow ones), early symphonies (these are from 1738 and are clearly in the pre-Classical mould) and Telemann (his Ouverture is a 19-minute, eight-movement work combining French and Italian styles and, although there is no Polish folk music, it's almost as appealing!). La Cetra Baroque Orchestra Basel; David Plantier & Václav Luks.